Bluegrass Crossings is located in the gently rolling hills of Ohio County, Kentucky at the intersection of William H. Natcher Parkway and Western Kentucky Parkway. Each of these parkways have links to interstate highways. The park is also within minutes of a major riverport ready to serve your intermodal needs. 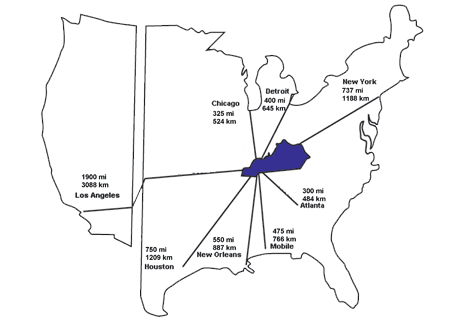 Our location is advantageous because Bluegrass Crossings is central to much of the distribution centers in the United States. We are within 600 (+/-) miles of more than 60% of the nation’s population, personal income and manufacturing business establishments. A major consideration when shipping products, meeting a customer, or closing a sale.